n-Join’s Industry 4.0 innovations turn revolutionary visions into reality. Their technology listens to all machine-to-machine communications within a factory, learns how production works in intricate detail, and shares deep insights, making manufacturing processes more efficient and less energy consuming. The EYSC ‘acceleration family’ around n-Join’s Chief Executive and Co-Founder Haim Piratinskiy aims not only to create strong partnerships between innovators and corporates, but also to provide answers to the pivotal question: “When the Internet of Things understands us, will we understand it?” Read more in our interview with Haim, as well as with Dirk Ramhorst from BASF, and Klaus Schoo from EY. Haim, do you really understand machines? And how do you understand your role at the EY start-up-challenge? To answer your first question: My actual academic background is in Psychology, which helps me understand machines and industrial systems as autonomous ‘smart’ entities that communicate, integrate, exchange, and learn. Not coincidentally, these are the key principles we build our technology on. Machines interact not only with each other but also with human beings. We gain deep insights into operation processes, allowing us to optimize them more efficiently and in real time, to make maintenance predictive, gain immediate data access, and detect abnormalities, − and our system does all of this autonomously. 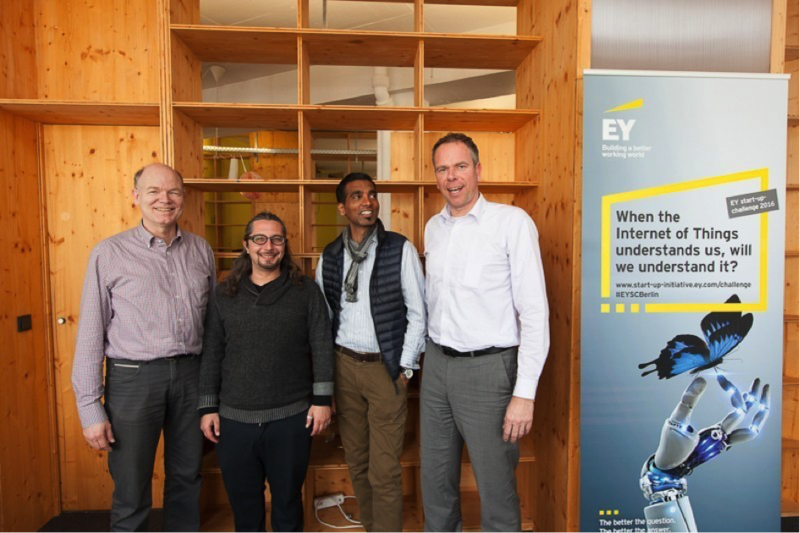 We have joined the EY start-up-challenge in order to exchange with mentors from established companies such as BASF and to draw upon their knowledge. Furthermore, we want to provide them with our IoT know how, and to create fruitful partnerships with them. Now, that is what we call a win-win situation. Would you agree with that, Dirk? Absolutely, yes. As Chief Digital Officer at BASF I am deeply convinced that the Fourth Industrial Revolution will not stop at the gates of the chemical industry. Like any other industry sector, we are facing the need to produce more efficiently and sustainably, and to reduce time-to-market. Furthermore, we need to implement a culture of innovation in our company, across all departments, and along the value chain – which, of course, cannot be done overnight. Robert Blackburn our President Information Services & Supply Chain Operations strongly supports our participation in the EY start-up-challenges exactly because he shares this conviction. To achieve our goals, we will have to continuously network with entrepreneurs such as Haim, team-up with them, and share our experience and knowledge. This exactly describes what we expect from the ‘challenge’. And what are your goals for the next 12 weeks, Klaus? Since I am very passionate about start-ups, new technologies, and the Internet of Things, my personal goals for the event are to learn more about what is the next big thing for innovators, and how they turn big visions into reality and marketable solutions. It is my eagerness to learn and to convey business knowledge, what makes me the serial mentor I am. Additionally, I want to get inspiration for my work, my activities as university lecturer, as well as for my private life. As an enthusiastic hobby cook I would say: the EYSC has all ingredients of a proper recipe for success. n-Join develops and implements groundbreaking Industry 4.0 technology which enables manufacturers to turn their factories into smart factories. The solution aims to enhance efficiency, quality, and profitability, while at the same time reducing environmental impact and consumption of resources. The centerpiece of the technology is a single device the size of a desk-top computer, which is quick and completely non-disruptive to install. n-Join’s technology functions autonomously, delivering real-time data analysis, unprecedented visibility, groundbreaking anomaly detection, and more.